Quack that whip! Quack It Good!! Formed in 1972 and pioneers of American New Wave music, this classic iconic band is still touring and sharing their genius worldwide. 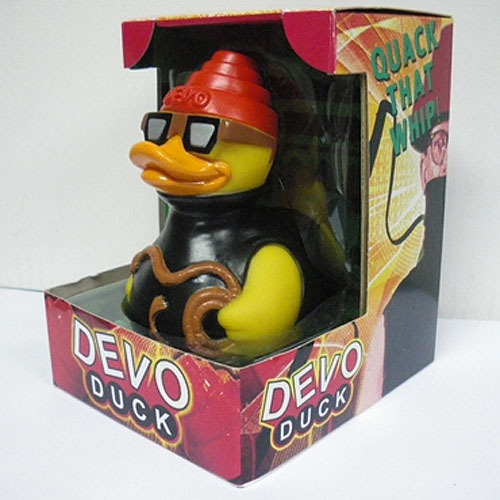 Now you can bring that same energy and fun to the tub with your very own Devo Duck! Devo is an American rock band formed in 1972 consisting of members from Kent and Akron, Ohio. The classic line-up of the band included two sets of brothers, the Mothersbaughs (Mark and Bob) and the Casales (Gerald and Bob), along with Alan Myers. Sadly Bob Casales, aka Bob2, passed away February 17, 2014 of a heart attack. The band had a No. 14 Billboard chart hit in 1980 with the single "Whip It". Their style over time has shifted between punk, art rock, post-punk and New Wave. Devo was also a pioneer of the music video with "Whip It" which was aired often on MTV.